We have released an update of our Oracle Management Pack (single agent). ​​For the new Oracle Management Pack (single agent) update we’ve updated the authoring template, including a Backup Instance as a possible target and a selection where the monitoring templates should rollup to, for example availability, performance, configuration and security. The digital revolution in the 1980’s and 90’s brought forth a hidden tribe of brilliant engineers, entrepreneurs and venture capitalists. This small tribe sparked an explosion of innovation in Silicon Valley and changed our world forever. One photographer, Doug Menuez was granted unprecedented access to document history in the making, and here are some iconic pictures he took. ​Adobe was the first company in the history of Silicon Valley to become profitable in its first year. John Warnock and Chuck Geschke (seated at left) confidently ready the launch of Photoshop, a landmark program that would utterly transform photography and the graphic arts. This followed their first breakthrough software called PostScript, completed after twenty thousand man hours of coding, which allowed personal computers to talk to printers. This seemingly small function was incredibly difficult to achieve and represented the biggest advance in printing since Gutenberg invented movable type in 1436. The duo left Xerox PARC (Palo Alto Research Center) after their brilliant ideas were ignored and founded Adobe in 1982 with $2 million. They read exactly one business book prior to starting Adobe and intended to sell a personal desktop computer with a printer. They did not initially envision revolutionizing the desktop publishing industry with fonts or design software. A few months after they opened for business, Steve Jobs showed up (1982, riding high in his first stint as CEO at Apple) and demanded to buy the company. His then in development Macintosh was going to ship with a laser printer, but his team could not write the requisite software. Steve pressed them to sell and come work for him. As Chuck told the story, they refused, and Steve responded, “You guys are idiots!” They called their investors, who urged them to work something out with Steve. They agreed to sell him shares worth 19 percent of the company, for which Steve paid a five times multiple of their company’s valuation at the time, plus a five year license fee for PostScript, in advance. This made Adobe the first company in the history of Silicon Valley to become profitable in its first year. During his reelection campaign, President Bill Clinton attended a fund-­‐raiser thrown by the top CEOs of Silicon Valley. L. John Doerr (center), interacting with Clinton, helped organize the visit at the home of Regis McKenna. During dinner, the CEOs peppered Clinton with questions related to complex technology, trade, and economic issues. Listening patiently, the president smoothly delivered a point-by-point response to each guest in turn, revealing a jaw-­‐dropping breadth of knowledge about all the issues, even obscure aspects of encryption technology. Everyone pulled out his checkbook and donated generously to the campaign. 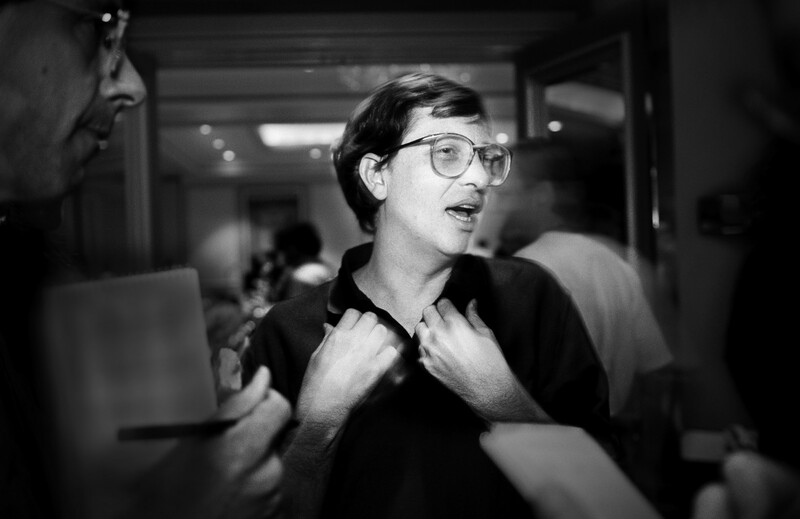 Microsoft CEO Bill Gates discusses cheap content for the masses and debates with reporters about the long-delayed vaporware upgrade to Windows at the Agenda ’92 Conference, hosted by the elegantly acerbic Stuart Alsop. Alsop showed Gates no mercy during an interview onstage, grilling him on why Windows was so late. Later that year, at the third influential TED conference, Gates was onstage making a presentation about digital content and the cost of photography, saying, “No one should ever pay more than fifty bucks for a photograph.” As Gates explained, he was completing construction of his high tech house in Seattle, whose interiors would feature screens with continuously changing displays of images. Licensing images on the scale he envisioned would be expensive, so he began to think about how to own or control vast archives of images. This led to the idea of forming a stock photography business originally called Continuum, tasked with developing large image libraries for online distribution. Later, not long after initial bad press from the photography trade publications the name was changed to Corbis. Rio Rancho, New Mexico, 1998. 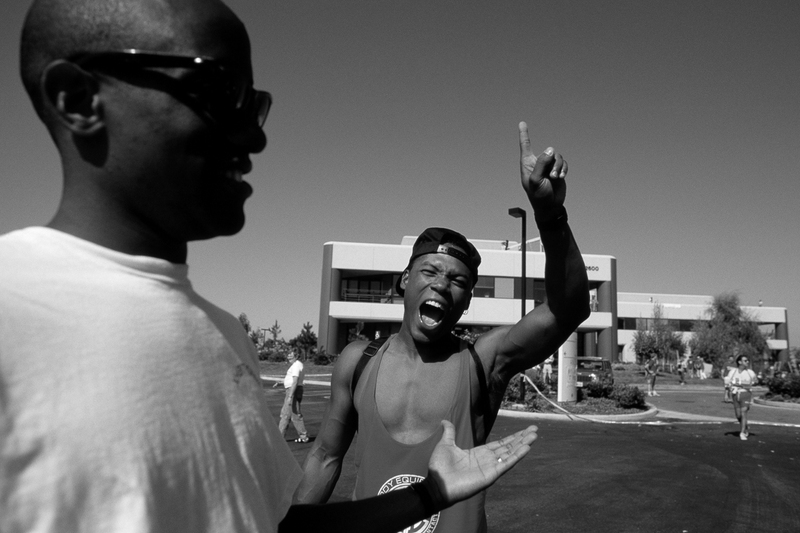 Workers inside Intel’s largest chip fabrication plant exercise and stretch as part of their break time. The plant is a giant, sterile clean room, so protective “bunny suits” must be worn through-out the facility to prevent contamination from skin and hair. These workers produce five chips a second, twenty-four hours a day. Many of them are from the nearby Pueblo tribe and maintain their traditions when not working with new technology. After work, many tend their corn and bean fields with their families before dinner. ​With its Unix-powered workstation, Sun was the fastest-growing technology company between 1985 and 1989. Legendary programmer and co-founder of Sun Microsystems, Bill Joy, wrote Berkeley Unix while a student at UC Berkeley and helped the US Defense Department with the TCP/IP stack code that allowed email to travel along the path of least resistance in case of nuclear attack. He then cofounded Sun Microsystems, became a billionaire, husband, and father, and patron of the arts. He also championed and helped finish the code for Java, perhaps Sun Microsystems’ most important legacy. Bill now believes unfettered innovation for its own sake endangers the very existence of the human race. In 2000, Bill published a manifesto in Wired magazine that stunned the technology world by challenging the accepted wisdom of unrestrained development. Triggered in part by meeting noted scientist Ray Kurzweil and hearing his ideas about the Singularity, when computers gain consciousness and we will upload our brains into a hive mind, Bill began forming his thesis. He warned that without thoughtful controls the convergence of our most powerful twenty-first-century technologies—robotics, supercomputers, nanotechnology, and genetic engineering—might destroy the human race. For the last decade, Bill has been on a global hunt for scalable green technology solutions to climate change. Apple Newton software engineers defy orders (and gravity) to not risk their lives until the product was done. Their boss, software engineering manager Donna Auguste, was not amused, but understood their need to blow off steam after years of intense work. On June 14th we had the pleasure of attending Belgium’s biggest IT Conference ITPROceed in Mechelen, organized by Microsoft Belgium. ITPROceed is THE technology geek fest for IT Professionals on Microsoft technologies, tools, platforms and services. For us from OpsLogix it was a first timer and we didn’t go there empty handed. You may have heard that we’ve recently joined forces with Coretech Global to offer three SCOM service packages to our customers. As expected, the announcement was very well received by the System Center community. We are convinced that through this partnership we’ve created added value for our customers, should they need additional services regarding SCOM. Needless to say that we are extremely excited about our partnership and the possibilities it offers to our customers. We offer full implementation support and fine tuning, SCOM health check and onsite SCOM trouble shooting service packages. For a first time experience we were very happy about the outcome. We saw some old faces and also met interesting new people and companies who are working on cutting edge Microsoft technologies for System Center. We’d also like to thank Microsoft Belgium for an excellent job on setting up an event that appeals to System Center users as well as vendors. Kudos guys! Last but not least! We will be attending Microsoft Ignite in September in Atlanta. Visit our booth to see what new exciting things we have coming up! We can’t wait!